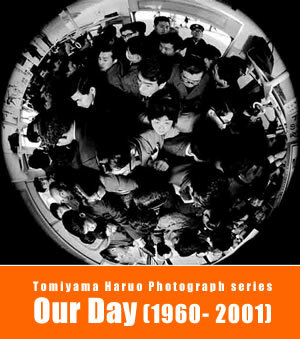 Tomiyama Haruo: A plan for the exhibition "ZEN" and "Our Day"
It has been 160 years since the photography was invented. As a universal language, photography has been recording a variety of human experiences. On the 4th of March 1880, a picture taken in a slum area was inserted in the New York Daily Herald. It was the first documentary photograph printed in the papers. Since then, photographers have been reporting tragic events like the First World War, the Spanish Civil War, The Second World War and the Vietnam War. Photo Journalism, which originated in 1920s in Germany, reached the peak of its popularity at the beginning of 1970s, when the LIFE Magazine sold 8.8 million copies in all over the world. In 1952, I was deeply impressed by Edward Steichen's photo exhibition held in Tokyo, and made up my mind to be a photographer. "To take photographs means to recognize both the fact itself and the rigorous organization of visually perceived forms that give it meaning. It is putting one's head, one's eye and one's hearth on the same axis." I always keep this Henri Cartier-Bresson's remark within my mind. 5 years ago when I was asked to take a series of photographs in Eihei-ji and Souji-ji by the Soto Sect of Buddhism, I decided to use a digital camera instead of traditional analogue cameras. 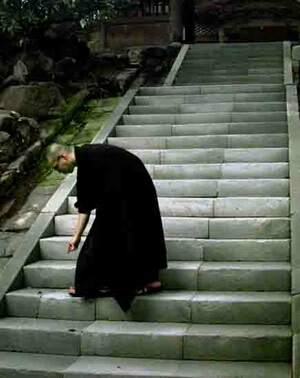 In the grey of the morning, a monk runs around the cloister of the temple while ringing a small bell in his hand to wake up other monks. For the traditional cameras, it is too dark to obtain his figure without making an electronic flash, which spoils the solemnity of the service. To my surprise, the digital camera, which I brought to the temple along with a Macintosh Power Book, managed to take a picture of him quite clearly. This experience told me that, though the fundamentals of photography don't change, the technology is changing revolutionarily. 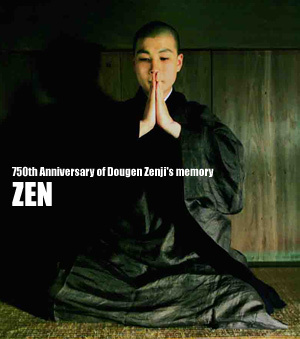 In the year 2002, we commemorated the 750th anniversary of Dougen Zenji's death.